The Historic Camelot Project is in the process of forming a 14c Living History Group - The Compainie of the Northerne Sterre to compliment our educational programs. I want to introduce our newest member - BARD. 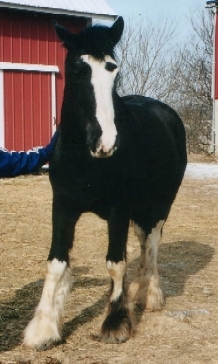 Our 16.2hh Clydesdale gelding. He begins his joust training (along with our Percheron/Belgian Mare, Sunny, that we bought last November) as soon as the snow and mud go away (enough for us to practice). Congrats, Lloyd! He'll make an outstanding addition, I'm certain. We have some folks a little north of here that raise Clydesdales. I remember almost driving off the road the first time I saw them standing along the fence. A truely magnificent animal. Oh, hey, I have a line on a half-draft (in Utah) that you might be interested in, if so drop me a line and I'll send you the info.